During the course of the conference, which was attended by participants from 21 countries, Brian, who is sought after as a violinist and pedagogue worldwide, shared his charismatic and infectiously enthusiastic nature with the conference participants. Brian hosted a number of workshops, including a three-part masterclass on the Bach Violin Concerto in A Minor, individual masterclasses with students, group classes, and a group session for teachers, before finishing off his visit with the presentation of his solo recital with pianist Heidi Curatolo. During the masterclass for teachers, Brian ran a fast-paced and engaging session with lots of demonstrating and trying out of new ideas. Attending teachers were able to play through the repertoire as well as experiment with sound and phrasing concepts. 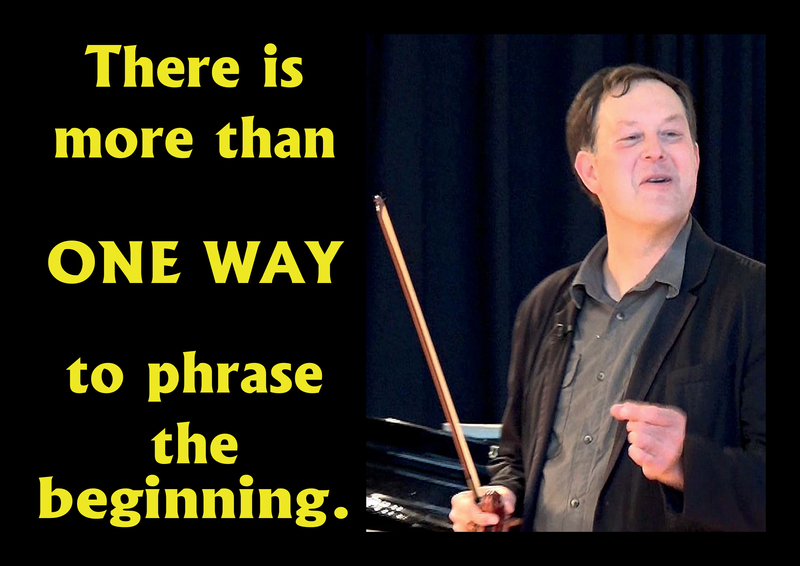 Brian encouraged the teachers to consider that there is more than one way to phrase the opening four notes of the concerto. The main consideration is whether to retake the bow, or to leave it on the string. Both scenarios impact the phrasing of this important opening sequence, and would appeal to two equally valid schools of thought. 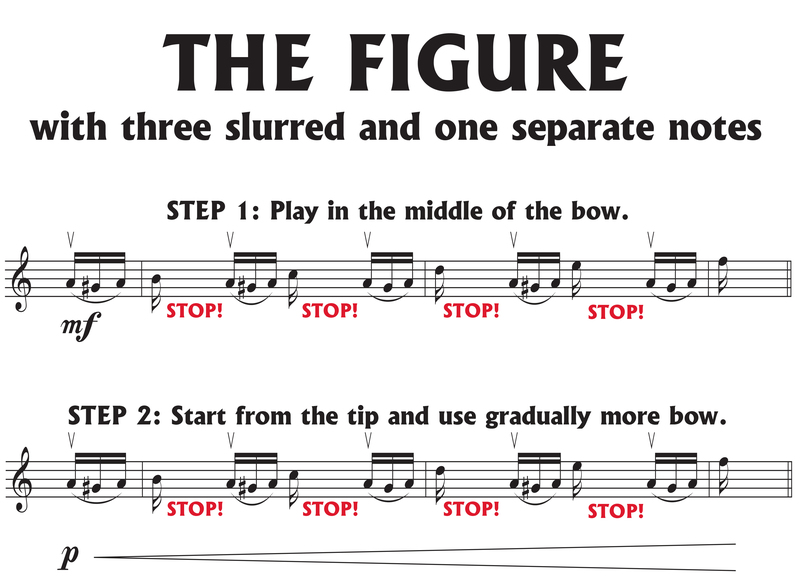 Brian explained that Suzuki encouraged him to retake the bow as it produced a more consistent sound and bow distribution which is useful when playing the concerto in groups, but Brian’s two Julliard teachers advised him not to retake the bow. Different teachers will always have different, but often equally valid philosophies, and as teachers ourselves, we must consider and understand the implications of any choices we make for our students. 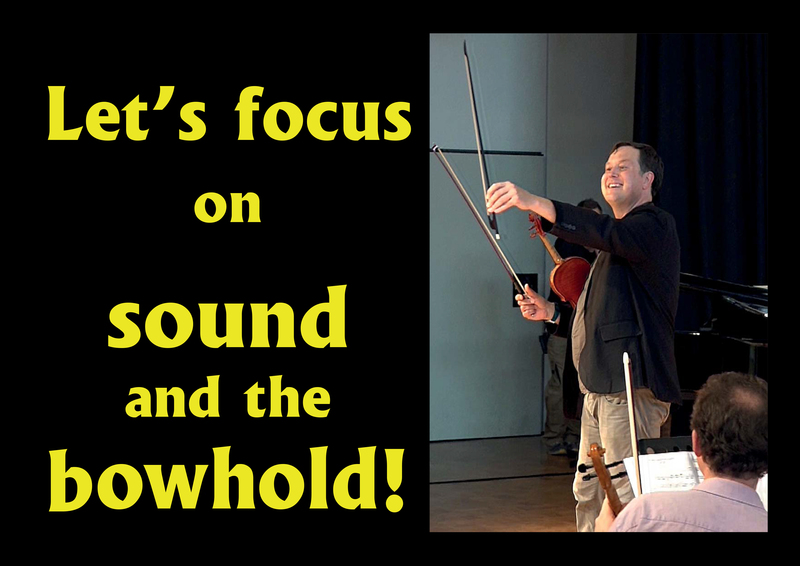 Brian encouraged the class to experiment with their sound by adjusting their bow hold. By moving the bow thumb up so that we put our pinkie on the bottom of the leather, we can replicate a baroque bow hold, which has the advantage of being able to negate the weight of the frog. After experimenting with this hold as a group, the teachers all agreed that it allowed a feeling of freedom with their bowing and sound, which Brian suggested resulted in new possibilities being opened up for phrasing and dynamic choices for the performer. Both of these bow strokes benefit from the experimentation of sound and bow hold. Dorothy DeLay suggested to all her students that they map out patterns in the Bach pieces they were playing. By identifying and analysing the patterns, the student gets to visually see Bach’s architecture, which is an invaluable tool to assist in the interpretation of phrasing and dynamics. Brian suggests that the analysis of Bach should start with the Bach Concerto in A Minor, as it prepares the student for the solo Bach Sonatas and Partitas that will remain with the student for the rest of their musical lives. On this note, Brian suggests that we should consider introducing our students to solo Bach via the last movement of the E Major Partita, as it is the most accessible to the developing violinist. Once the first movement of the Bach Concerto in A Minor has been mapped out for patterns, it is easy to see that the first pattern starts in mm. 4-7. By placing a stop after each unique pattern, the patterns become clearer, and after being practiced in this manner for clarity (stop, prepare, play), the stops can eventually be removed to see the progression of entire pattern. Brian then leads us to understand that by linking smaller patterns together, we can make a bigger, more useful pattern. For example, mm. 126 – 137 contains four smaller patterns that can be linked together to make a bigger pattern sequence that occurs four distinct times. Each of the smaller and larger patterns have musical connections and consequences. For example, each pattern could be interpreted in a different dynamic range. Brian suggests that it is acceptable to play either faster or slower than the researched range, but performers must have the knowledge that they are doing so. The choice of tempo must be an informed choice rather than the choice being because they ‘just feel like it’. The third movement of the Bach Concerto in A Minor is a dance, and we must feel the dance in our bodies and play it as such! Brian guided us through some activities we could try with our students. First, we must find our dominant foot and hop on it whilst we play. It is a difficult activity to achieve, but it helps the performer to feel where the dance is within the music. 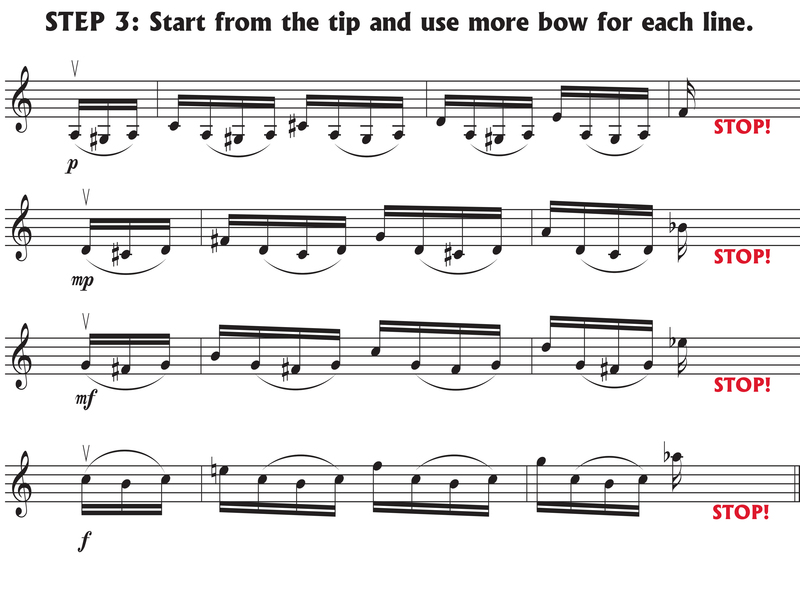 Another good piece to work with on this bowing and dance feel is the Gigue by Veracini, which can easily be worked on as a review piece for this level of student. Brian reminded us that the bariolage section in the third movement can cause significant problems for students, and must be mapped out carefully in advance. 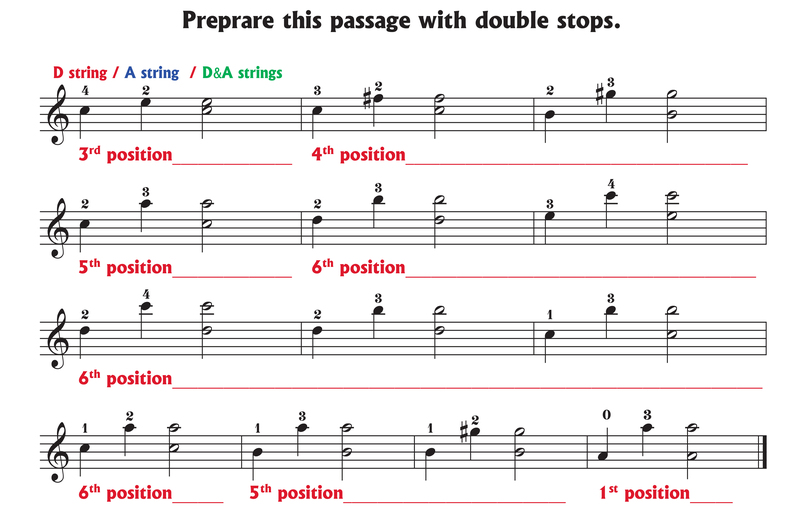 Bariolage is a string crossing technique that involves an open string, and the student must be very conscious of their elbow position in order to maintain a consistency of sound over the strings. If you consider that each string has three arm level positions, for example A1 (near D), A2 (middle), A3 (near E), then there are twelve possible arm level positions on the violin. 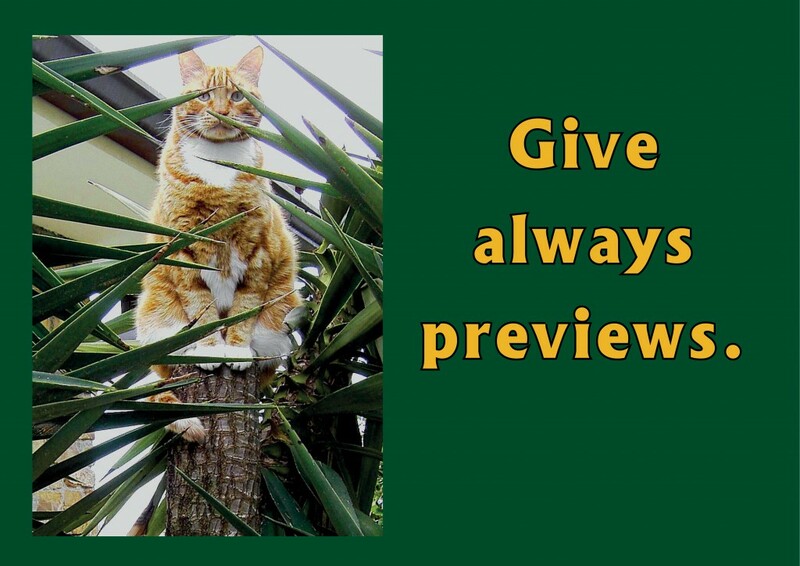 As teachers, we will need to guide the student carefully in sections such as mm. 105 – 117 to make sure the bow is not too right side orientated, otherwise the E’s will dominate the Sound. This however, does not need to be addressed during the first stage of learning, as this type of clarity can be refined at a stage of development where the piece is being polished. Brian finished the Bach Concerto in A Minor masterclass by stressing that our job as teachers is to empower our students to be the very best they can be, and as teachers, we must aim to remove any limitations we see surrounding the progress of our students. He also suggested that we plant the seeds of Bach here with the Concerto in A Minor, which will last our students for the rest of their lives. Therefore, important work must be invested here to sustain the development of the student in years to come. For more information on the teaching of Dorothy DeLay, an excellent starting point would be ‘Teaching Genius – Dorothy DeLay and the Making of a Musician’ (Sand, 2005). Oxford Dictionary (2015). Available at: http://www.oxforddictionaries.com/definition/english/appoggiatura [Accessed 1 Dec 2015]. Sand, B. (2005) Teaching Genius – Dorothy DeLay and the Making of a Musician. New Jersey, USA: Amadeus Press. Helen holds an MA in Instrumental Teaching from the University of Reading (where she graduated with distinction), and violin teaching diplomas from Trinity College London (ATCL), and the Associated Board of Royal Schools of Music (DipABRSM). We hope to meet you all again for next year’s Conference, and extend an invitation to all violin, viola and cello teacher of the worldwide Suzuki community. Become a member of our ISTEX facebook group!